We were lucky once again, and caught a good cab driver when we arrived in Mexico. This time the mission was the Chacchoben ruins site, located about an hour from the port in Costa Maya. It had been raining all morning, so many potential site visitors stayed inside and hung around the ship. No way I was staying onboard with those ruins out there calling to me. As luck would have it, the sky cleared a little by the time we arrived, and we had the entire site to ourselves. What a break! Ben and I wandered among the various excavated areas of the site, took pictures, and enjoyed the outdoor solitude. When we returned, we still had time for a beer and a basket of tortilla chips before reboarding the ship. As we strolled to the dock, I noticed this local resident who had been enjoying Mexican beers all afternoon. 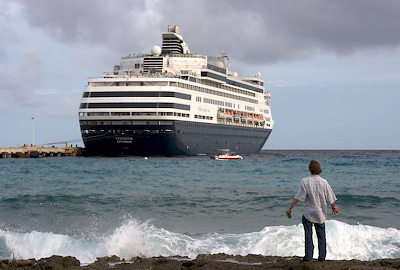 He was standing at the shore shouting at the cruise ship. I wasn't exactly sure what he was saying, so I created the title to this blog post myself. We're back at sea now, and today is a teaching day for me. More to report soon.